As winter approached once again I turned my attention to a club water which poses a slightly better chance on producing than my chosen venue for the rest of the year. 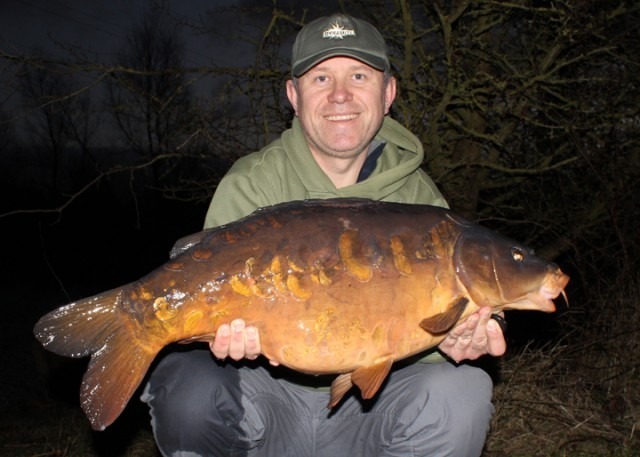 I returned in early December and it took me a couple of trips to find the fish, I did see fish in the vicinity of the swim I had chosen but without any result. I started with stringers and pva bags to begin with, but the lake is surrounded by trees and woods, so there was a lot of leaf matter on the lake’s bottom and I was bringing in leaves on the hook. Not being 100% sure if it was on the retrieve or not I had to change to pop-ups in the shape of hinged or chod rigs, so my hook baits were presentable all the time. Then the night before Xmas Eve I decided to try another area of the lake which holds some deeper water and is partially sheltered from the cold winter northerlies. For this water I chose to switch to the Red-Amo bait which has a great winter track record for me and for a lot others anglers for that matter! I cast out two chod rigs and a pva bag of whole and broken-up 15mm Red-Amo boilies to just past the margin drop off past some weed in 12ft of water. I then sprinkled the area with a couple of catapult pouchfuls of 15mm boilies. I’d arrived after work in the dark, it was time to get the stove going, then see what the night brings me. Between 10pm and midnight I received a few single a double bleeps to two of the rigs, then eventually the middle rod signaled a take, it was an up and down bream type take, but I was happily surprised when the fish woke up and took line off the spool. A few moments later I slipped the net under what looked like a 20lb mirror, the scales read just under but I was happy for sure and I might have found their winter spot! I returned for 2 nights during the Xmas break and managed a 15lb and 26lb mirror, 1 each night, again both around midnight. The 15lb mirror came to the bottom bait with with a pva bag of Red-Amo, and the other fell to Monster Tiger 15mm pop-ups. As I left I trickled a little bit of bait in. My next trip was the first weekend of 2017, again I arrived after work in the dark and while it was raining. It took me 3 trips to get my gear to my swim of choice and I proceeded to get setup, it was only then I realized the lake was still frozen but had been disguised by all the rain. The ice was 15mm thick and I doubted it would thaw by the morning, but I got in the bag to see what it looked like at first light. To my surprise the lake had thawed and I was able to fish for the next 24hrs, but nothing occurred for me, or anyone else. It transpired the lake had frozen over on the Wednesday so it had been like that for 3 days. I then waited until everyone had gone on the Sunday afternoon and then had a lead about to see if I could find anything else, and I did, another 12ft area at the back of a gravel bar. So I spodded this area with Frenzied Hemp and Red-Amo boilies and did the same where the 3 fish had come from so far. I like to use hemp if I can in the winter and try and keep the spots clear of leaf litter, and the birdlife don’t bother with it either, a win win as far as I’m concerned. I moved a few things around and then I was able return this week for a midweek overnighter before the dreaded forecasted freeze arrived. I place 2 rods where the bites had come from, 1 with a Monster Tiger pop-up, 1 pva bag of Red-Amo boilies, then the third with a 15mm Monster Tiger pop-up to the new spot at the back of the bar. I had an occurrence of 2 bleeps on the left hand rod around 11pm, but nothing further happened, then while I was packing everything away for work, the right hand rod fished to the new spot was away with a flyer, with me finally netting a 22lb 13oz dark scaley mirror, what more could you ask for, as your first fish of the year.